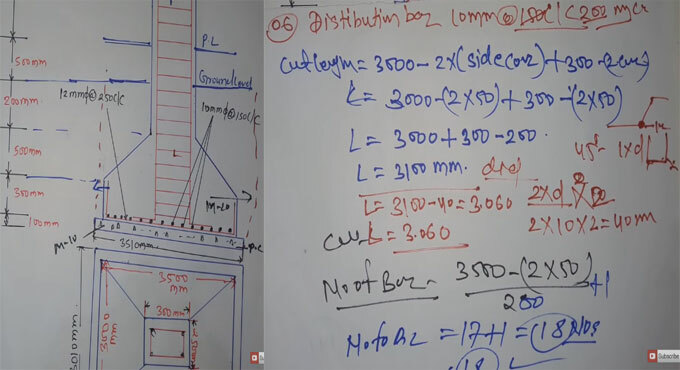 This construction video tutorial is recorded on the bar bending schedule & quantity of sloped footing. There are three types of footings which range from sloped footing, steeped footing and single footing. Sloped footing is defined as a footing that contains sloping top or side faces. In sloped footings, the operative cross – section in compression is restricted with the area over the neutral plane, and the angle of slope or depth will be formed in such a manner that the design needs are fulfilled at each section. Sloped footings that are designed as a unit should be built up to assure action as a unit. Steeped is defined as a footing in which the required width is protected with various steps in about the ratio of one unit of horizontal dimension to two units of vertical dimension. Single footings are also known as Isolated footings. These are applied to provide support to the single columns. These footings are very cost effective. These are specifically utilized when columns are arranged at comparatively long distances.